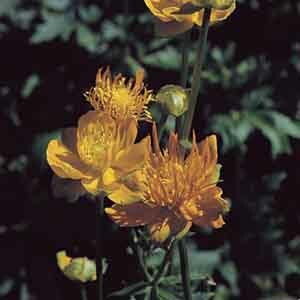 The golden petals of Trollius chinensis curve in on themselves in a very rounded manner, when the blooms are closed, giving a globe-like appearance to each flower head. When they are fully open, the effect becomes like a delicate cup and saucer. Cutting back the stems after flowering will encourage a second flush of blooms. Especially nice in waterside gardens. Perfect for use in swampy areas and areas around ponds, lakes and streams. Cut flowers are long-lasting in fresh bouquets. Thrives in boggy conditions. Grow in fertile, humus-rich soil. Do not allow soil to dry out. Remove faded flowers for best display. Apply a summer mulch to retain moisture.